The Medical Association for Prevention of War (SA Branch) and Australian Red Cross will conduct a special commemorative event, Adelaide Hiroshima Day Vigil – a public event to remember Hiroshima and Nagasaki 70 years on. The event will take place at Victoria Square on Thursday, 6 August, 5 – 7PM. 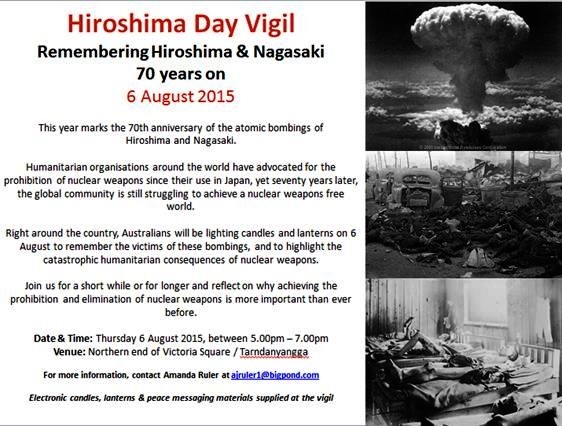 The Medical Association for Prevention of War (SA Branch) and Australian Red Cross warmly invite you to attend this special commemorative event, Adelaide Hiroshima Day Vigil – a public event to remember Hiroshima and Nagasaki 70 years on. Join the world peace movement to light candles to and lanterns on which you can write your message of peace to commemorate this special anniversary. During the vigil time of 5pm – 7pm, please join the gathering for simply some minutes or choose to stay longer. 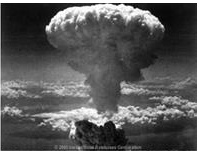 Join with other like minded individuals and organisations and remember the victims of the atomic bombings and – in doing so – highlight the catastrophic humanitarian consequences of nuclear weapons and reflect on why achieving the prohibition and elimination of nuclear weapons is more important than ever before.